A TRUE "Home Away From Home" Our OceanVIEW unit in an OceanFRONT complex is a 2 bedroom, 2 bath condo suitable for couples, families or friends. Beautiful hardwood cabinets and quartz countertops in the kitchen with complete kitchen utensils, dishes and accessories. 18' porcelain tile throughout the living area. Fresh paint, raised panel doors and updated bathrooms. Tastefully appointed in Nautical/Florida themes, this spacious condo has all the comforts of home. Kingsize bed in the master, twins in the guest room and a queen size sleeper sofa in the living room (ALL linens are provided) 3 TVs,(with cable) DVD in the family room, FREE wi-fi, videos, stereo, games, books, puzzles, children's toys and books, beach gear, (beach towels, chairs, umbrellas and sandtoys) and of course, a blender for those tropical drinks you'll be needing after a long day relaxing in the sun and fresh air! 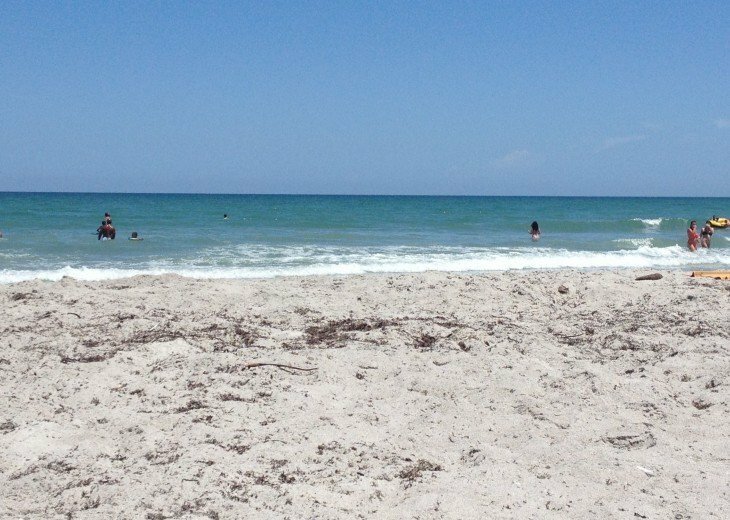 :-) Perfect for couples or families ~ all you need is your toothbrush and sunscreen! It truly is our 'home away from home' and so it is fully stocked with everything that we have wanted or needed while we visit. 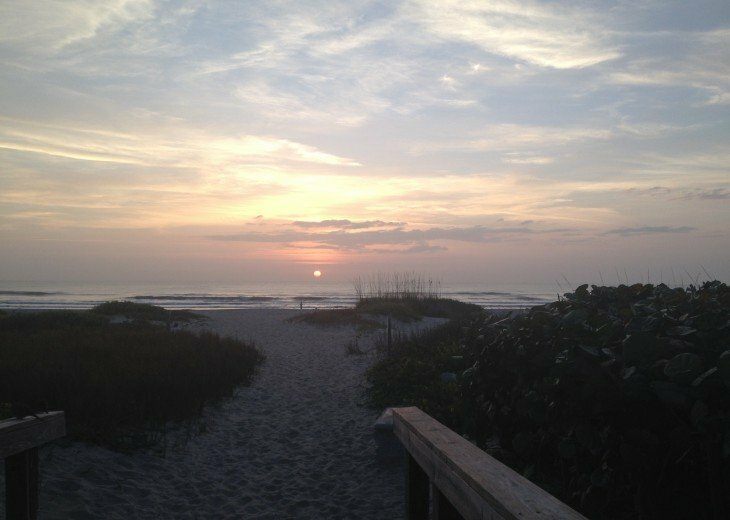 We love watching sunrise and morning 'traffic' coming/going to the beach from the balcony! We have continued to stock the unit with the interests of our kids as they have grown. Kids movies (some more obscure than others) and books are available. 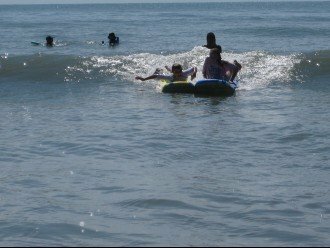 The pool and beach remain their favorite activities but they also love the mini-golf, kayaking, and paddleboarding. SO MUCH TO DO! Booster seat, port-a-crib, umbrella stroller and child's safety bedrail available in unit. Holiday rates subject to change. Unit must be booked at least 1 week PRIOR to arrival. Damage/Security Deposit is REFUNDABLE after standard cleaning. 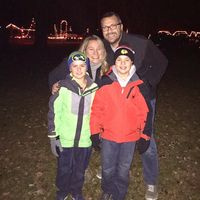 About the owner: When our children were toddlers we were searching for a vacation spot that we could visit every year to build great memories. 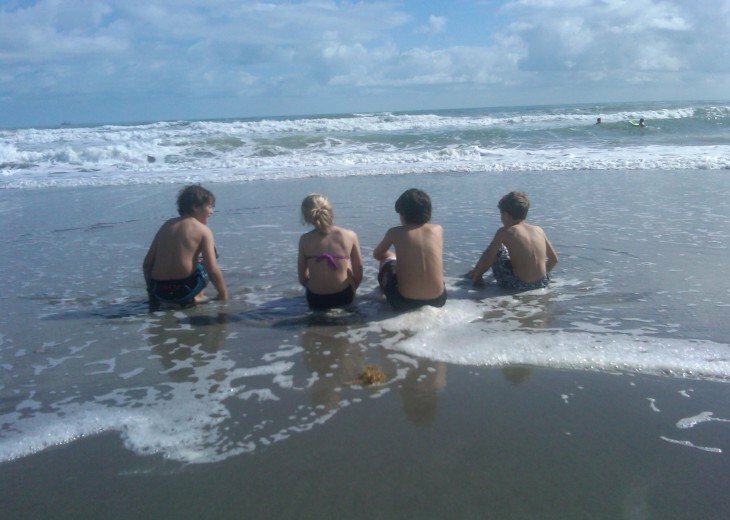 We fell in love with the slower, laid back pace of Cocoa Beach and Sandcastles drew us in. . . The Sandcastles complex was safe, clean, incredibly maintained and FUN. A giant leap of faith later and Sandcastles became our 'home away from home' Our kids learned to swim in the heated pool, surf in the Atlantic waves and practiced patience waiting to be 'old enough' to sit in the Sandcastles hot tub :) It remains our favorite family escape! Why this property? Sandcastles remains incredibly well maintained. The complex is situated DIRECTLY on the beach and also offers a beautiful heated pool and spa. Thank you so much for having such a lovely condo available for us Midwesterners! I really enjoyed cooking in the kitchen, you had everything I needed and more! You really pay attention to those small details. 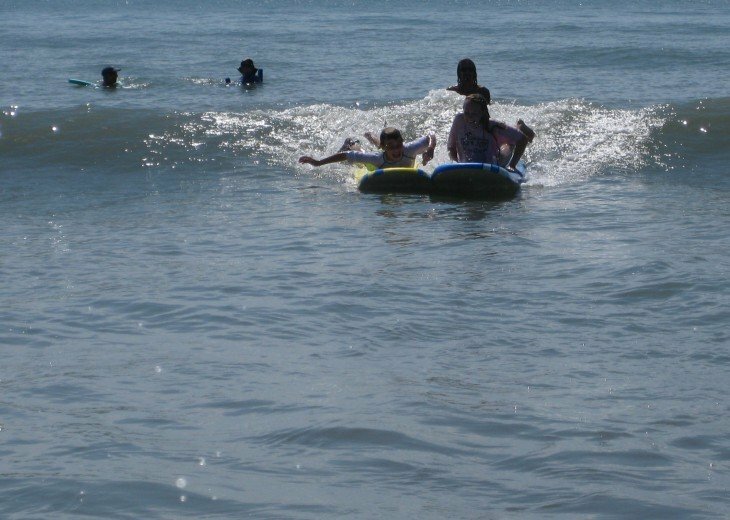 The appointments were all spot on for a beach vacation so we really felt like we were some place SPECIAL! It was a great stay and the weather even cooperated. We were really thrilled with the condo we stayed in. We really enjoyed how close to the beach we were - you are literally right there. The condo was not only clean and cute, but it also had everything we could possibly need as a family of 4 for our week long stay. The heated pool was a great perk too - especially since the weather wasn't the best for a couple days of our visit. Thanks for a fantastic place to stay! We’ve stayed in this condo several times and it really feels like coming home. The only things we ever need are a few groceries since the condo is very well stocked with pool toys, chairs and towels. Nice to have water bottles and plastic glasses for outdoors also. Beds are super comfortable and we always sleep very well. The property is VERY well maintained including a spotless pool and hot tub, landscaping and buildings. 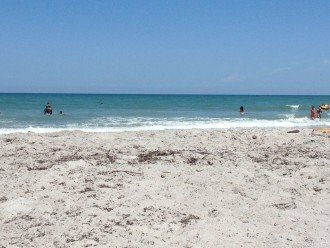 We love being on the beach and close to so many restaurants in Cocoa Beach and surrounding area. We look forward to our return trip this winter! Our family stayed for the second year in a row at this property. WE LOVE IT. The condo has everything you need to enjoy your vacation. Our kids are 11 and 7 and have already told us they want to go back next year. The closet with sand toys, chairs, body boards is filled with everything you need so you can pack light. 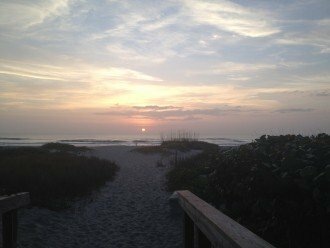 The beach is right out the back door of the condo complex which is great for multiple visits to the beach. Our children loved making sand castles, looking for sand crab, collecting shells and enjoying the waves. The pool is also one of the favorites. We could not be happier with our experience at this "Home Away From Home". We are looking for dates for next year!!!! Thank you Audrey! We love having you back - it sounds like you are making great memories!